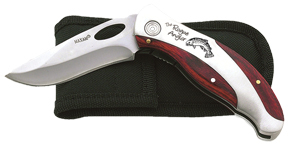 We are very proud to offer this quality lock-blade knife etched with a leaping trout and our Rogue Angler logo. This knife is 7 3/4" when open, 4 1/2" closed and weighs about 8 ounces. It features a stainless steel blade, cherrywood inlays, and includes a nylon case with belt loop. A very nice knife at a great price!